The sequel to the epic social/building game gets more melodious and cuddlier. My Singing Monsters: Dawn of Fire lets you build your own monster band and find secrets hidden in various islands. You will need to feed otherworldly creatures, make them learn new songs, breed new monsters and place them on the island. Each monster has its own song to tell and the entire jingle made up of musical bits and pieces sounds grander once you add more creatures to the melody gang. You will usually find crystal(s) scattered around the island, in every nook and cranny. Try searching for them around the edges of an island. Sometimes they will appear in the same place and sometimes they will be hidden behind trees, breeding structure, nursery and other structures. You should zoom in first and then look for them. Crystals are used to upgrade the vault and the castle, remove obstacles, so they can be very useful at times. Use crystals to upgrade the vault once the vault reaches the required amount for leveling-up as this will free up storage space for foodstuffs and recipes. Don’t just feed any monster. Feed those first that max out early so that you can teleport them to another island and unlock it. For example – Vollca needs to reach level 20 first and only then you can teleport him to the Cave Island, but Narms needs to reach level 10 to get teleported to the Space Island. So your first preference should be to feed and level-up Narms and then you can focus on feeding Vollca and others. Prioritize monster feeding and feed those who reach the required teleportation level quicker than the others. You may also feed those monsters first that appear in your quest list and complete those quests to earn bigger rewards. You also earn extra coins after feeding a monster. 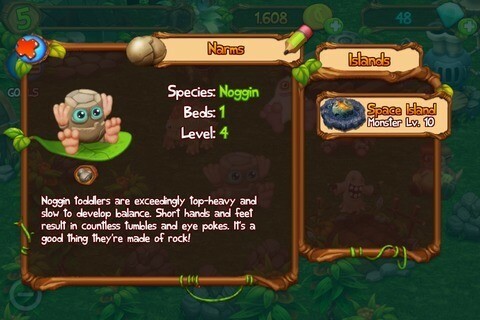 Monsters need food so they can level up to breed and learn new a new song once they get teleported to a new island. Keep producing delicious dishes and harvesting fruits and grains. The magic tree can produce a max of three fruits, unless you have added a new slot. 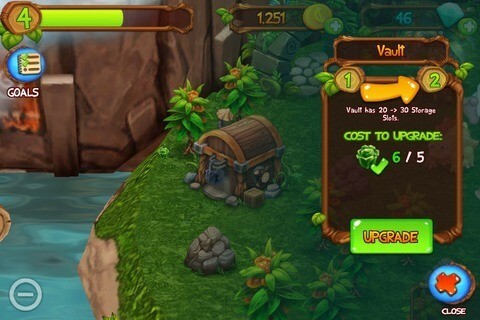 Make sure you tap on a fruit to transfer it on the vault to empty slots and then drag fruits again to start producing. Do the same for the food production units – tap on the completed items to store them to the vault and free up space for more items. Also, before dragging an item to a food production unit, tap and hold to check whether all ingredients are available or not. Most recipes need more than one fruit or multiple fruits of the same type for a dish, so keep your magic tree busy producing fruits. An exclamation mark above a monster means it wants the food you have prepared. Tap on the monster and drag the food toward him to feed him. Keep repeating the steps above to level-up monsters faster. Focusing on your goals not only lets you understand how the game works, but also earn more rewards, including coins and XP. Tap on the Goals button at the top-left corner of the screen and look for new objectives each time your complete a goal. The Goals button notifies you which objectives you have completed. Every goal has a reward for players. Goals like leveling up and teleporting monsters will earn you gems whereas placing a new monster on an island will give you maximum XP and coins as rewards. Completing goals will also help you level up faster. You receive XP only after a goal is completed. The XP you have collected fills up the level-up meter at the top-left corner of the screen. Once it’s full, you level-up and the game unlocks more monsters and/or structures. You can add an extra slot to your food production units as and when the situation demands. Spend gems to add an extra slot. 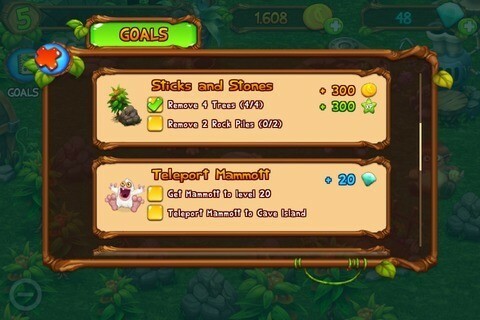 You can earn gems by teleporting monsters to a new island or by removing trees and rocks. Spend your gems wisely, they are not easy to earn, so use them to unlock a slot only when you want to accelerate food production. This should be done immediately once you have collected the required number of crystals. As you progress, you will need a number of ingredients for newer recipes. Multiple ingredients of the same type will also be required to prepare recipes. In such circumstances a bigger vault would be a great idea as it can store anything, except decorations. Collect crystals and use them to upgrade your vault. Many times, you will require a different type of crystal to upgrade your vault. Such crystals won’t be found in the current island. You will have to unlock a new island by leveling up and teleporting a monster to it and search for a new crystal in the new island. 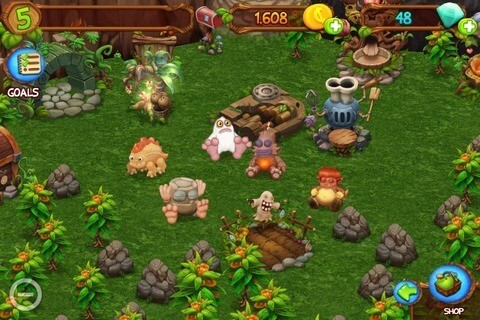 Tap on a monster placed on your island and then tap on Info to know what level it has to reach first before it can be teleported to an island. Many times, removing trees and rocks can earn you a random reward – gems, ingredients, dishes etc, but not all trees or rocks give a reward. Removing them will require crystals and those shiny trinkets aren’t easily available, so don’t just keep removing every object on the island. Remove those unwanted objects that act as obstacle for your new construction.